27/08/2018FAO is implementing the project entitled “Sustainable cropland and forest management in priority agro-ecosystem of Myanmar” in collaboration with the Ministry of Natural Resources and Environmental Conservation (MoNREC) and the Ministry of Agriculture, Livestock, and Irrigation (MoALI). The project is funded by the Global Environment Facility (GEF) and will run for 5 years – July 2016 to June 2021. The project aims to build the capacity of farming and forestry stakeholders to mitigate climate change and improve land condition by adopting climate-smart agriculture (CSA), sustainable forest management (SFM) and sustainable land management (SLM) policies and practices. The Project helps in mitigating the looming threats of climate change to which Myanmar is very vulnerable. The Project pursues an innovative approach for integrated land use planning, capacity building at all levels, promoting and upscaling best practices for Climate Smart Agriculture and Sustainable Forest Management across the landscape. At field level, the project works through Farmer Field Schools (FFS), Community Forestry Initiatives and promoting integrated land-use planning and digital land use mapping processes in five pilot Townships from three different agro-ecological zones: i) Mindat and Kanpetlet Townships of Chin State in upland/hill zone, ii) Labutta Township of Ayeyarwady Region in coastal/delta zone, and iii) Kyaukpadaung and Nyaung-U Townships of Mandalay Region in central dry zone. Climate Smart Agriculture (CSA), a key component of the project, has been involved in establishing CSA support program within key institutions, demonstrating CSA practices mainly through FFS and enhancing carbon storage in three priority agro-ecosystems in Myanmar. One of the key activities under the CSA Component of the project is to support establishing a CSA Center in Myanmar. Based on the agreement with the concerned Ministries and other stakeholders, a National CSA Center has been established at Yezin Agriculture University (YAU). The CSA Center will act as the national CSA knowledge repository and catalyst and is a focal point for the advancement of knowledge, monitoring of impacts, and adoption of CSA/SLM practices. 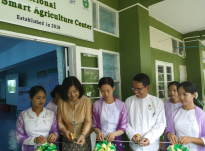 In view of the above, the National CSA Center was jointly opened by His Excellency Dr. Aung Thu, The Union Minister for Agriculture, Livestock and Irrigation and Ms. Xiaojie Fan, FAO Representative in Myanmar on 17th August 2018. Senior officials of the Ministry of Agriculture, Livestock and Irrigation (MoALI), and the Ministry of Natural Resources and Environmental Conservation (MoNREC) as well as the invited guests from the Parliament, National Education Policy Commission and respective universities attended the opening. During the launching ceremony, H.E. Union Minister stressed the vulnerability situation of the country from the impact of climate change and importance of CSA Center in promoting CSA techniques and practices for adaptation and mitigation of the adverse climate impact in achieving sustainable goal. Ms. Fan expressed the collaborative efforts of FAO in Myanmar for the last 40 years to improve livelihoods and food security of the people and also presented the objectives of the CSA Center as follows. To conduct advocacy activities related to CSA/SLM and climate change in coordination with appropriate organizations. (Department of Agriculture, Department of Agriculture Research, YAU and other relevant organizations). Dr Nang Hseng Hom, Acting Rector of YAU welcome all the participants and extended heartfelt appreciation to FAO for the supports in establishing CSA Center and revising the curricula for Agricultural Degree courses (graduate and post-graduate) integrating CSA. In order to operationalize the CSA Center effectively in a sustainable manner, a National CSA Technical Support Group (TSG) has been formed chaired by YAU. This working group represents a national cohort of Myanmar’s best experts associated with CSA/SLM approaches including representation from YAU, Department of Agriculture (DoA), Department of Agriculture Research (DAR), Department of Planning (DoP), Department of Agricultural Land Management and Statistics (DALMS), Forest Department (FD), and FAO. The main objective of the TSG is to coordinate among the relevant stakeholders, make strategic decisions and guide effective operationalization of the CSA Center. FAO will provide necessary supports during project implementation phase for the establishment and operationalization of a CSA Center. However, it is expected that the project and National CSA Technical Support Group will make certain that by project close, the Center is fully functional with adequate staff and financing secured from government and/or other sources.